Is my content valuable? Where are visitors coming from? Is all of this website cost and effort paying off in the form of new clients? 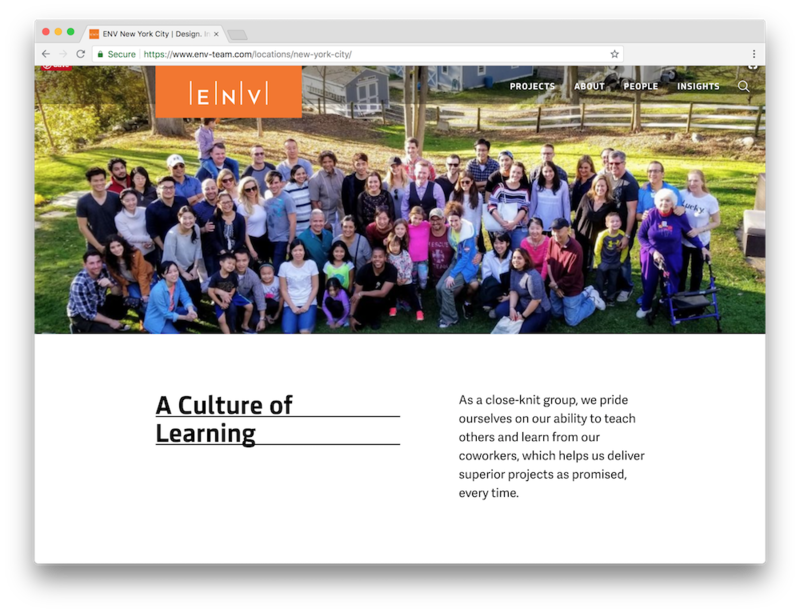 Before, during, and after the website design and development process, we here at TOKY field a number of questions from our architecture clients about how the firm’s website is actually performing. No matter how stunning a website looks or how accurately it embodies the leadership’s vision, at the end of the day, marketing teams are concerned about return on investment (ROI) — and rightly so. Determining an architecture website’s ROI all comes down to data. And while Google Analytics is an invaluable tool, teams can find themselves overwhelmed by the sheer volume of information. Below, we’ll cover some of the most frequent ROI-related questions we hear from our architecture clients. You’ll also find instructions on how to pull the right data from Google Analytics and leverage those insights to measurably improve your site and achieve key marketing objectives. Question 1: What do clients and prospective clients want to know about my firm? Many architecture firms have a gut feeling about the types of content that clients and prospective clients will consider valuable. You and your firm know your clients well, but sometimes, intuitions can be misleading. Fortunately, Google Analytics can quantify perceived value by telling us which content visitors are actually clicking. Within the Google Analytics dashboard, navigate to Behavior > Site Content > All Pages. Be sure to select the Page Views metric from the drop-down menu. Here, you will find a list of your firm’s top-viewed pages. For many firms, Home, Careers, and Portfolio will top this list. To find your top-viewed pages within Google Analytics, navigate to Behavior > Site Content > All Pages. Once you identify your top-viewed pages, revisit this popular content to identify potential areas for improvement. Is messaging written to tell an engaging, differentiating story about your firm? Is there a clear path leading visitors from your highly viewed pages to other important content? On the other hand, are there pages that you and your team expected to be among the most-viewed, but according to data, fall flat? In these cases, take a look at the findablity of that content. Can users quickly find the pages via the website’s main navigation? Are these pages promoted through marketing channels such as social media or email newsletters? Question 2: How are people finding out about my firm? Which marketing tactics are bringing visitors to your website? Are all those hours spent on social media or e-newsletters paying off? By figuring out where visitors come from, your firm can make more informed decisions about how to allocate outreach efforts. The best way to figure out where visitors are coming from is through Google Analytics’ Acquisition metric. Within the Google Analytics dashboard, navigate to Acquisition > Overview. Here, you will see a breakdown of your top traffic sources. Most firms want to see an increase in traffic from direct, referral, and social visitors because those users tend to be more familiar with your company and therefore more likely to engage. Google Analytics’ Acquisition metric shows a breakdown of your site’s traffic sources. Is your organic traffic significantly lower than social, direct, and referral traffic? If so, your website may have a search engine optimization (SEO) issue. Consider running an SEO audit to ensure that your website is optimized for search engines and humans. Are visits from social media lower than you expected? This may present an opportunity to revisit your social media strategy. Perhaps the types of content shared are not the types of content users are interested in. Or maybe the time, money, and effort going into Facebook would be better spent on another platform, such as LinkedIn. Question 3: Are website visits leading to new business inquiries? For many firms, the overarching goal of digital efforts is to field inquiries from potential clients. Business development teams often track these opportunities through the firm’s customer relationship management (CRM) system. On the marketing side, you can take the tracking process a step further using Google Analytics to chart user paths and discover clues as to why visitors are (or are not) reaching out to your team. Start by figuring out the percentage of users who end up on your Contact page. To do this, find your Contact page within the Page Views data. Next to your Unique Page Views, you will see a percentage, which tells you the portion of all website visitors who actually made it to the Contact page. If more inquiries is your goal, this is the number you want to increase. To find the percentage of website viewers who make it to your Contact page, navigate to Page Views > Contact Page and look for the percentage next to Unique Page Views. To understand the paths your users are taking through the site, take a look at Google Analytics’ Behavior Flow metric, located under Behavior. Within the Behavior Flow, notice which pages users are arriving on, where they go next, and where they drop off. Pinpoint your Contact page within the User Flow to better understand how users are getting there. 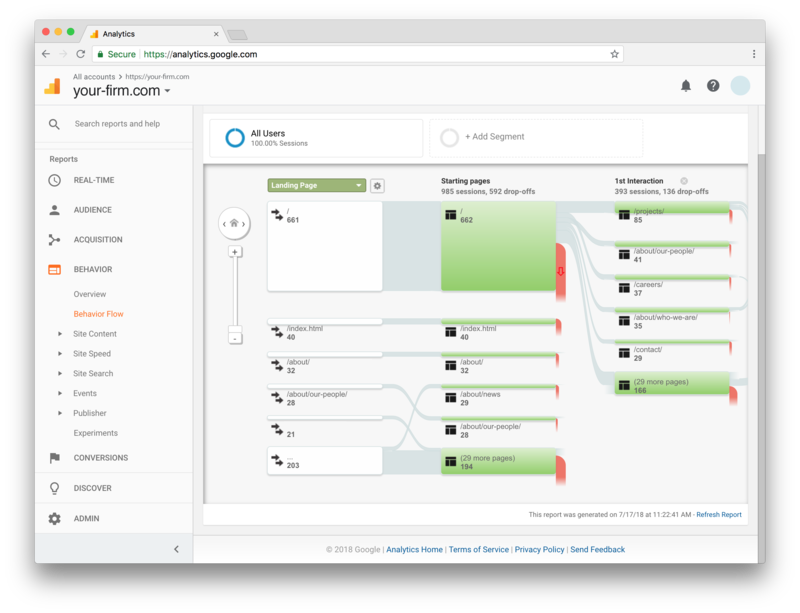 To find out how users navigate through your site, visit Behaviors > Behavior Flow. Pro Tip: Google Analytics has the ability to track not only which pages users view, but also which buttons they clicked to get there. While tracking these actions requires extra code on your website, the resulting insights are well worth the effort. To get started, contact your web designer or developer. Perhaps the number of users visiting your Contact page is lower than expected. Below are a few tips for increasing visits to your Contact page. Make your Contact page easy to find. If your users can’t find it, how can you expect them to get there? We recommend making “Contact” a main navigation element, as well as inviting the user to connect throughout your website. If you notice that users are visiting the Contact page, but not going through with the actual outreach, use these tips to increase conversions. Make sure your contact method is friendly and easy to use. While forms are the most popular tool for Contact pages, users typically prefer a direct email to a real person (i.e., someone with a name and a picture). Give your users options. Not everyone is immediately ready to take the plunge and reach out to your business development team, so work with these users by providing a few “baby steps.” Invite visitors to follow you on social media or sign up for your newsletter. 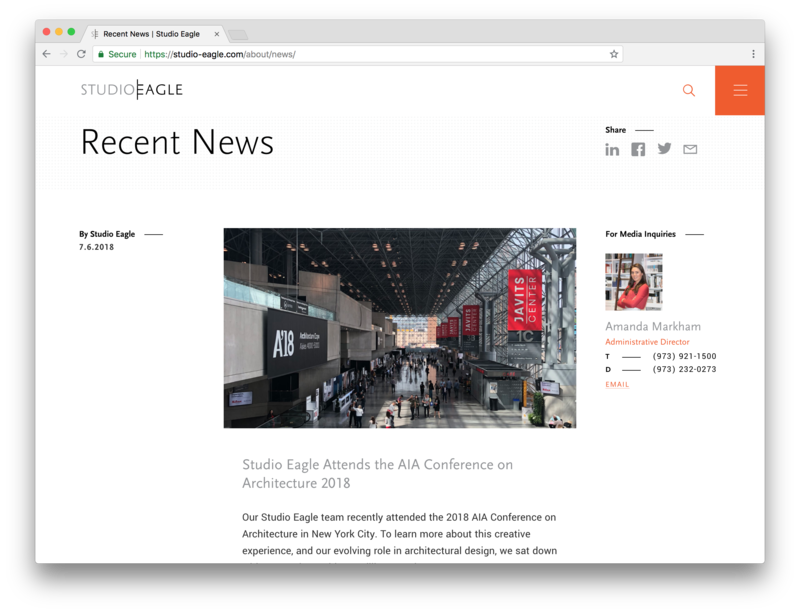 Studio Eagle invites visitors to connect with the team on many pages throughout the site. The invitation features a real person with a name, photo, and multiple contact methods. Question 4: How is my Career page performing? How are candidates finding us? Firms around the world are competing for talent, and your Careers page is an important tool in landing those recruits. Google Analytics can help your team build a better Career page based on the behavior of real candidates. There are several data points you can use to find out how prospective hires are viewing, interacting with, and finding your Careers content. In Google Analytics, navigate to Behavior > Site Content > All Pages. Browse this list to find data related to your Careers Page. Start with Page Views to see how many people are actually getting to this page. The same area will also show the Average Time on Page for your Careers content. This metric will help indicate whether visitors are stopping to read your content or moving on quickly. Use the Acquisition metric for your Careers page to track where people are coming from. Once you have found the Careers page within Behavior > Site > All Pages, click the link to view referral sources. Compare the number of people who are coming to the site and the number of people who are actually filling out an application. This data can be gathered by adding custom code to track which visitors are clicking the “Submit” button. If your Careers Page Views are lower than expected, make sure this content is easy to find. Is the your Careers page included in your main navigation? Are you promoting this content via third-party sites, social media, and by encouraging members of your team to share openings? Is your Average Time on Page low? Make the content more engaging by talking about your culture, values, and unique benefits. If you advertise your listings on third-party job sites, you may notice that a large portion of visits come from referral sites. This is a good way to tell which of those third-party sites are bringing in the most users, and which are worth the spend. If visitors are not taking the final step to apply, make sure your application is easy to find and user-friendly. Don’t scare away the best talent by using a form that indicates your firm doesn’t value experience or design. Plugging your firm’s unique culture throughout the site can help drive interest in (and traffic to) your Careers content. Pictured above, an introduction to the culture at ENV New York City. 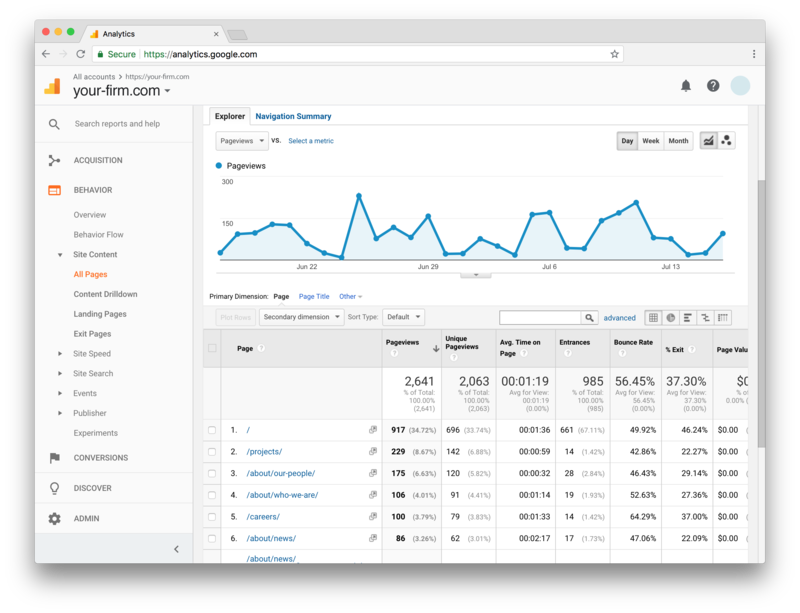 Google Analytics can be intimidating, but the data contained within this tool can be incredibly powerful to any internal marketing team. By coupling your knowledge of prospective clients and the industry overall with real-time website data, you can optimize everyday marketing decisions to win more clients and talented recruits. Have a specific question about ROI and website data that was not covered in this article? Reach out to a member of our team at info@toky.com.